Pacific Islanders have been drinking kava kava for centuries. Many varieties of kava species grow across the islands, each one different from the next. Drink a cup of kava and your lips and tongue will go numb and your body will relax. The effects of kava kava come from a mix of compounds called kavalactones, each of which has different characteristics, creating a variety of effects on the nervous system from happy, euphoric, and creative, to relaxing and numbing. 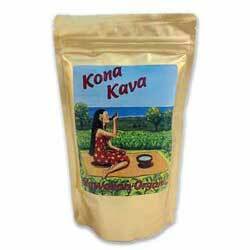 Kona Kava Farm’s kava is a “Happy Kava” that is typically a 4-2-6 chemotype (Dihydrokavain-Kavain-Methysticin), making for the most effective and sweet-tasting kava in the world. Kona Kava Farm is nestled on the fertile volcanic slopes of Kona’s Hualalai Mountain in Hawaii, where climatic conditions and micronutrient-rich soil are famous for producing some of the world’s most sought-after coffee. These ideal conditions produce a kavalactone-rich, yet surprisingly smooth-tasting kava kava. Kona Kava Farm brings us more returning customers than any other kava farm we’ve worked with. A testament to the purity and strength of their 'Awa! This kava kava root is the pride of the family run farm, and we offer our 100% Satisfaction Guarantee to any customer who doesn't think this fantastic kava is the best they've ever tried.